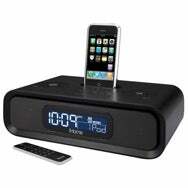 Among the various iPod-compatible alarm clocks I’ve looked at, the iHome iP99 is my favorite so far. It’s compact, provides good sound for its size, has plenty of useful features, and sports a relatively easy-to-use interface. The package includes the main unit, a detachable AM antenna (an FM antenna is permanently attached to the unit), three iPod-dock adapters, an AC power supply, and a remote control. Two AA backup batteries are pre-installed; the unit I received was already set to the correct time. There's also a line-in port on the back for connecting another audio source. The iP99 measures in at 10.6 inches wide, 6.3 inches deep, and 3.1 inches tall—about the size of your average clock radio. The front grille has two speakers flanking a liquid crystal display that features white illuminated numbers on a black background. The numbers are large and easy to read, and the display also tells you the current date and indicates which alarms are active. There are eight different levels of illumination for the display (including off), which you can cycle through by hitting the large snooze/dimmer button. This choice of brightness levels is nice, but having to repeatedly hit the dimmer control to get back to your preferred illumination setting is one of the unit’s few annoyances. For example, I prefer to have the display off when I sleep, but if I want to check the time, I have to first hit the dimmer to activate the backlight, then hit it again repeatedly to turn the light off again. A feature to temporarily light the display before turning it off again would be nice. The control panel on the top of the iP99 features two large scroll wheels bracketing eight small round buttons in front of an iPod dock that uses Apple's Universal design. The left-hand scroll wheel controls the volume; in its center is the unit’s on/off button, which is also how you stop the alarm when it goes off. The right-hand scroll wheel is used to set the time, alarm time, and current radio station. In its center is a Play/Pause button for controlling a docked iPod or iPhone. These scroll wheels mostly work well, although it can be a little tough to get them to rotate smoothly—doing so requires more pressure than expected—especially if you’re lying in bed and reaching over the unit. The rest of the iP99’s controls, excluding the snooze/dimmer button, are the same shape, which makes it difficult to tell them apart, especially by feel alone. However, they're all backlit to make them easier to differentiate visually. The row of buttons closer to the iPod dock contains a button to activate the radio and to toggle between AM, FM, and line-in, as well as three radio-preset buttons (each of which can store two stations per band, for a total of six per band). The row closer to the snooze button includes a Sleep button, a control for the unit’s equalizer, and alarm 1 and 2 buttons for controlling the two independent alarms. Setting alarms is easy: pressing and holding either alarm button, 1 or 2, lets you not only set that alarm's time (using the right-hand scroll wheel), but also choose which days each week that alarm goes off. You can choose from all seven days, just weekdays, or just weekends. This is great for people who want to wake up at different times on the weekends, but don’t want to have to change the alarm time before and after each weekend. Alarms 1 and 2 are completely independent: you could, for example, set one to weekends and one to weekdays, and one to wake to iPod music and the other to wake to the radio or the buzzer. (Neither alarm can wake to input on the line-in port). There’s also an option to wake up to a random song in an iPod playlist, but to use this feature, you must first create a playlist named “iHome” in iTunes and then sync that playlist to your iPod. The iP99's display makes it clear, using large type, which setting you’re adjusting, which is great. The snooze timer is also user-configurable, allowing you to choose anywhere from 1 to 29 minutes of snooze time by holding down the snooze button and then setting the desired length with the right-hand scroll wheel. Despite the fact that the iP99 includes only three dock adapters (for the original iPhone, the original iPod touch, and the third-generation iPod nano), it’s compatible with any iPod sporting a dock-connector port. I tried the unit with a variety of different models, and had no problems with any of them. However, despite the fact the iP99 bills itself as iPhone-compatible, my iPhone still prompted me to switch the device into Airplane Mode when I docked it in the unit. I decided not to, and mostly had no problems with interference; I sometimes experienced GSM buzz when the phone was in EDGE mode, but less frequently than with other units I've tried. On the other hand, if your iPhone is set to ring, that ring will play through the iP99's speakers (the phone, as expected, will fade out your music when you receive an incoming call). And you can even use the iPhone's speakerphone function while it's docked in the iP99, though you might have to crank the iP99's volume a bit (which can be annoying when the music resumes after you finish the call). When your iPod or iPhone is docked, the iP99's buttons offer only limited playback control. You can adjust the volume on the iP99 and tap its Play/Pause button to stop or resume playback, but there are no next/previous-track buttons on the iP99, so you’ll need to use either the included remote or the controls on the iPod itself. The iPod or iPhone will charge as long as it’s docked. The sound quality of the iP99 is actually pretty good given its small size. It comes across as a little muddy sometimes, and the bass is obviously not as good as you’d get from a unit with larger speakers or a subwoofer, but I found the sound to be fine for casual listening. You can adjust the audio presentation somewhat by pushing the iP99's equalizer button, which lets you use the right-hand scroll wheel to adjust treble, bass, and balance, and to enable/disable the SRS WOW functionality. At its loudest, the unit can put out some substantial volume, and I didn’t notice any significant distortion at higher volume levels. The included remote control adds a bunch more functionality for music playback, though I’m never sure how useful remotes are for alarm clocks, which are typically operated within arm’s length. Besides offering most of the same functionality as the buttons on the iP99 itself (except for setting the alarms), the remote also adds options for shuffle, repeat, next and previous tracks, mute, and buttons to control the iPod’s menu system. The iP99 has a few quirks, such as its dimmer controls, and it’s a bit more expensive than some other models we’ve reviewed. But it provides a nice balance of good features, user-friendliness, and solid performance.